While sometimes unfairly dismissed as a “no-style” plan, the traditional house design has evolved into something very popular and adaptable. 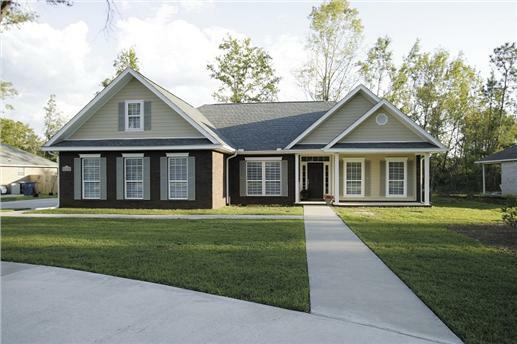 Experts have even depicted the traditional house plan style as a “pacesetting style”- one that bridged the classic –think Tudor and cottage styles - with the joys of modern living - think ranch style. 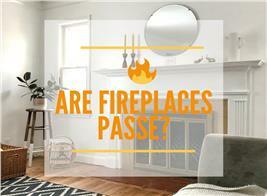 Some experts also describe this as “transitional” or “new traditional” style. It is perhaps the most difficult architectural design to describe because it is an amalgam of several styles. 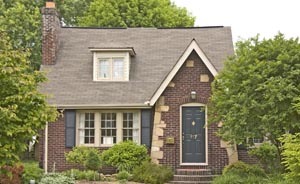 Try a mix of Colonial, Colonial Revival, Cape Cod, Ranch, Tudor, and Victorian. One of the more prevalent styles in the U.S. and Canada, the traditional house is designed to accommodate the American way of life – practical, flexible, accessible, comfortable, and welcoming. Traditional homes display a casual, relaxed, homey, and friendly feel that is pure American. 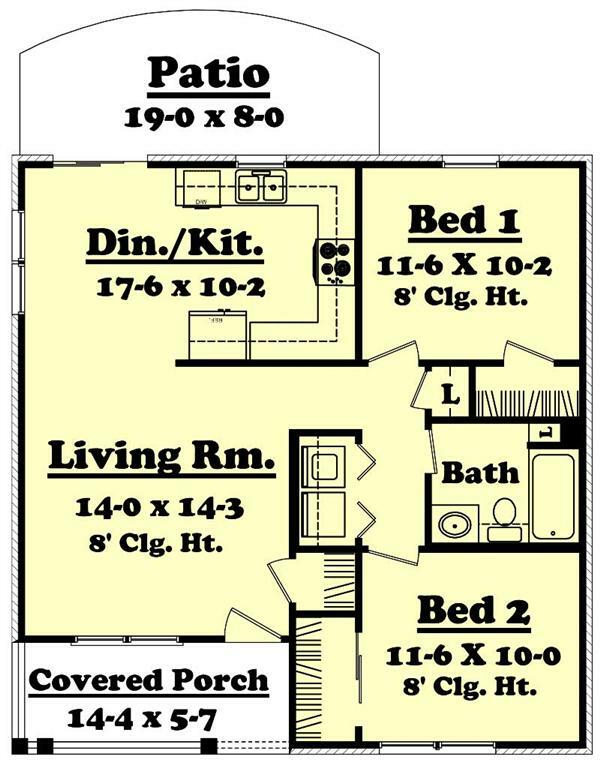 No wonder they are often referred to as American house plans. Here’s a traditional colonial style home for the ages (left). Its exterior features include three chimneys, brick on four sides, and an attached three-car garage. 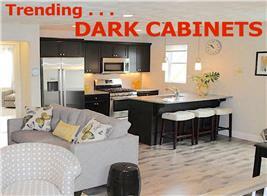 There are five bedrooms, five baths, dining room, living room, parlor, a library and an oversized kitchen. A large deck and covered porch are perfect for outside entertaining. 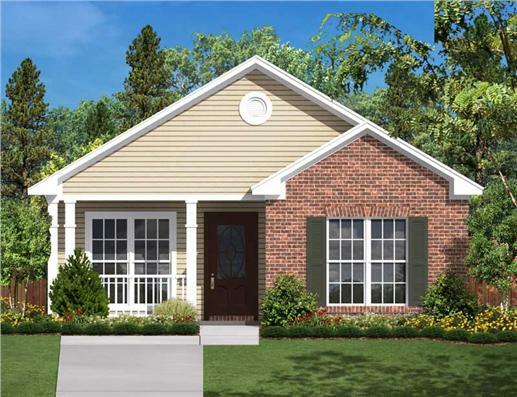 The quaint three bedroom, two-bath home on the right features a white picket fence, landscaping, and a covered porch. 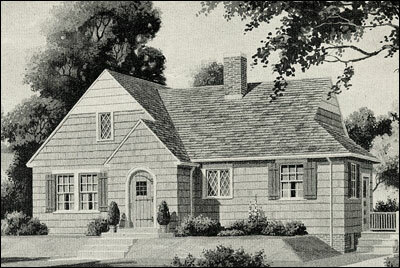 The traditional house plan can be as simple and functional as a “first” home or as elaborate as a country estate. They are usually single-level structures – although there are some two- or three-story traditional homes. Since several architectural styles are mixed together in a traditional house, its features are not as cut-and-dried as other house plans. However, you can look around your neighborhoods and try to spot some of these characteristics that emphasize comfort, the informal, and innovative. The unstable economy and volatile world conditions during the Great Depression and immediately after World War II compelled Americans to build affordable and durable homes. Style and artistry barely entered the picture at the time – instead families focused on the basic and practical, but nonetheless, pleasing and charming. Built from 1925 to 1950, these homes were very simple, no-frills one story, two-to-three bedroom structures - described by experts as “minimal” traditional. 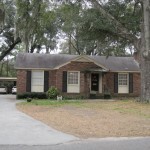 Although rather small – around 800 square feet – these traditional homes were made of the same superior quality materials – brick, stone/limestone, wood, and metal siding - as the bigger and more expensive styles. Either square or rectangular in shape, these traditional homes had small porches and awnings, a front-facing gable above the entryway, attractive windows, and on occasion, a chimney or two, and some decorative touches. While the accent was always on the functional and comfortable, their designs allowed plenty of room for innovation. They constructed attics that were high enough to be converted into extra bedrooms or additional sleeping space. 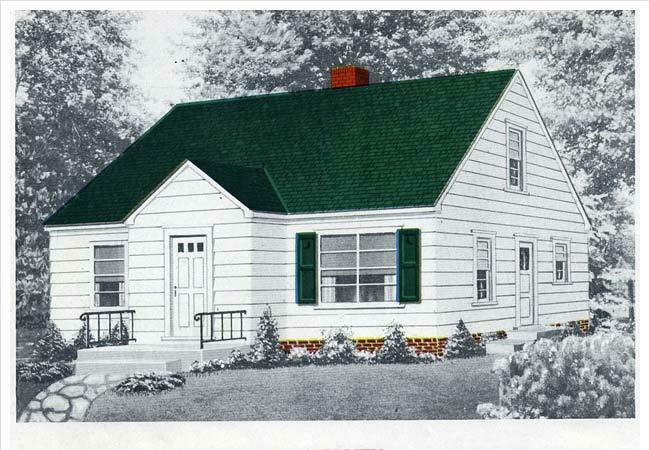 A rendering of a minimal traditional home from a Sears-Roebuck kit (left). The minimal traditional home (circa 1925-1950) on the right and below both feature the front-facing gable, symmetrical windows, brick exterior, and paint colors of earth tones. The plan for these minimalist traditional house includes a living room, kitchen, two bedrooms, full bath, and spacious closets. Because of its classic rectangular shape, the traditional home was easy to transition to the sprawling ranch house, the country home, and other architectural styles. And in the years after World War II – when the ranch style was etching its way into the architectural landscape – families were adding extensions to their traditional homes or enhancing some of the features to get with the times. The graceful lines were always visible, as were the dramatic and symmetrical windows, the timeless porches and entryways. But the essence was always the creation of a cozy and “feel-at-home” environment – a true American style. 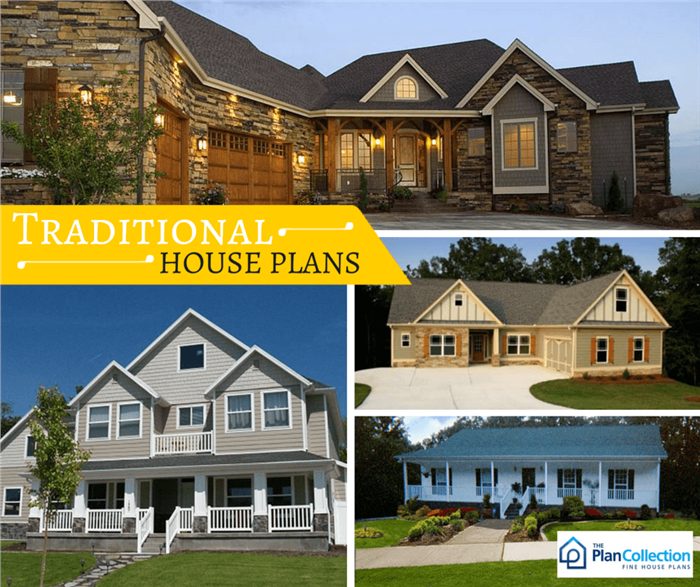 Take a look at these traditional home plans and more from The Plan Collection’s Traditional Houses & House Plans… and toss out that opinion of the traditional house as boring and dull. The covered porch, manicured lawn, and long windows add to the charm of this traditional home. The porch opens into the living room and kitchen/dining areas. There are two bedrooms with a shared bath. 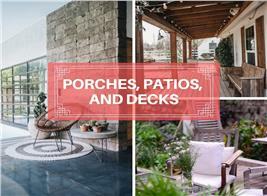 A rear patio completes the home’s informal accents. Don’t you just love the graceful lines of this traditional country home? There’s a covered porch, a screened porch and patio – and oh, there are four bedrooms, 3 1/2 baths, and open floor plans that accommodate the living and dining areas. Traditional house plans #141-1082 (left) and #109-1086 (right). So, have you looked closely at the houses on your street? Any traditional houses with new house plans in your neighborhood that stand out? Is there a renovated or refurbished original “America’s house plan” around the corner?